I'm having a problem with TeamCity 5.0.3. It tells me I have Configuration problems with my VCS connection. Here are the error details. What's interesting is that I deleted the path "/svn/trunk/SteamAchievements/css", so I'm not sure why its still looking there. I tried rebooting the server and also deleting the agent work directory, but it still gives the same error. Looks strange, especially if you really cleaned up the sources. - enable SVN debug logging on the server and send us the logs. 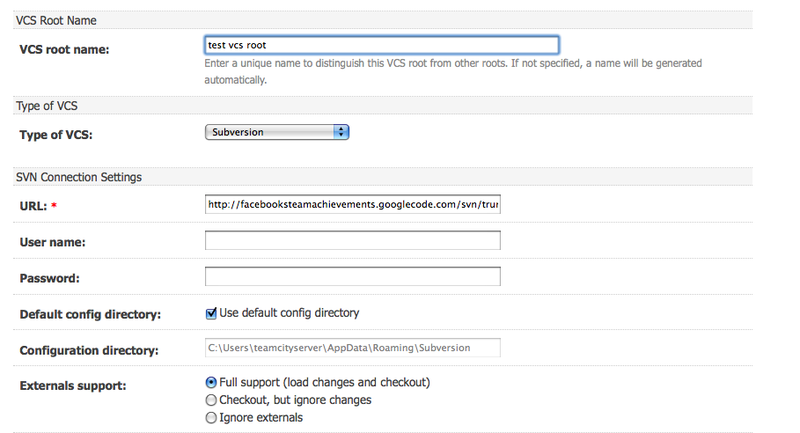 - review you VCS settings (or attach screenshot here). I enabled the debug logs. I didn't see anything different, just the same error that I already posted. But then I tried deleting the VCS root and then recreating it with the same settings and its been working so far. I'm glad it works for you . Most likely, there was some syntax error in your VCS root settings.